Yesteryear actress Kamini Kaushal makes a comeback on the big screen with Yash Raj Films' Laaga Chunari Mein Daag. Then again, 'comeback' is the wrong word here. The 80-year-old has been busy with television serials like the Chandamama puppet show on Doordarshan -- where she made and lent her voice to the puppets -- as well as the recent Shano Ki Shaadi. It has been getting tougher for Kamini to work in serials, as she has to travel two hours each way from her home in Malabar Hill, South Mumbai, to sets in suburban Andheri. With Laaga Chunari, Kamini makes a return to Yash Raj Films decades after her 1969 film with the banner, Aadmi Aur Insaan, starring Saira Banu, Dharmendra [Images] and Feroz Khan. Like her role in Lagaa Chunari, where she plays a loving grandmother to Abhishek Bachchan [Images] and Kunal Kapoor [Images], Kamini seems just as fond of Abhishek, whom she has seen grow up. "I have seen him as a child and as an adult," she smiles. "Abhishek is so tall and handsome now. He is very nice to work with. It took time for him to find his feet, but now he has. I hope it takes him places." "My relation with the Bachchans is very old," she continues. "Amitabh's [Images] mother Teji and my eldest sister went to the same college and were best friends. They moved to Mumbai and remained friends until my sister died." Her interaction with the Bachchans continued, thanks to the film industry. 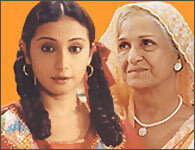 Kamini acted with Jaya Bachchan in the film Uphaar, which was India's entry for the Oscars that year. Like the Bachchans, Kamini knew the Mukherjees quite well too. She tells us she knew her Laaga co-star Rani's father, Ram Mukherjee, since the time she worked with the filmmaker years ago. She has also worked with Rani earlier, in Chori Chori and Har Dil Jo Pyaar Karega. "I can share a lot of things with these youngsters," says Kamini. "And they give me a lot of affection. Both Rani and Konkona (Sen Sharma) are warm and lovely to work with. They have no hang-ups." Kamini is all praise for director Pradeep Sarkar as well. "Dada has an eye for detail. Nothing can pass him by. Not only does he take care of the shot or performances, even the frame is marvellous -- whether it is a leaf falling from the sky at a particular time or a spray of water from a hosepipe. These are details another director may overlook. Yet he is quite undemanding. And, of course, he is a very nice person. Most stars give him hell; he stands a lot of nonsense from them," she says. Kamini's role in the film is quite small. In fact, she didn't even have to travel to Varanasi where most of the film was shot. Sarkar promised her a bigger role the next time. This was, of course, very different from what she was offered when she was younger. "Everything has changed. Everything is better planned now. But we had a more personal involvement in the work then. Now, it's done very professionally. In those days, if I wanted a day off, I would plead with them. Today, the leading ladies just inform everyone they are not available. Times have changed." Kaushal was a popular child artist on All India Radio in Lahore [Images], before the Partition. She worked for pocket money in those days. She would go to the studio, read the script, perform and return with a cheque. 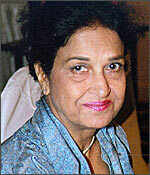 Filmmaker Chetan Anand spotted her, and offered her the film Neecha Nagar in 1946. Kamini shifted her base to Mumbai soon after. "I hated the smell of make-up in those days," she reminisces. "It would give me headaches." The film gave her more than just a break in the industry. It gave her a name. Born Uma Kashyap, Chetan Anand decided to give her a new name, as the film starred another Uma, his wife. Kamini wanted a name that began with 'K,' and that is what she got. She went on to star in Gajanan Jagirdhar's Jail Yatra, which was also Raj Kapoor's second film. Later, Kapoor asked her to star in his directorial debut, Aag. Kamini soon became a producer and signed on then matinee idol Ashok Kumar in Poonam and Night Club. "I was very touched when he fell ill some years ago," Kamini tells us. "I was visiting a relative in hospital, where he was also admitted. So, I met him. His room was dark. I entered, sat with him for a while and said a few words. Before leaving, I gave him a smile. Many years later, his daughter gave me a very cute note from him. It said: `You know what made me survive? That smile you gave me when you came to see me at the hospital.'" Kamini married her brother-in-law after her sister passed away, leaving behind two daughters. Soon, she was a mother of two more. After a break, she shifted from playing lead roles to character roles. She played Manoj Kumar's mother in Shaheed. "I made a big fuss about playing his mother, but he had made up his mind," she says. "He said he would wait until I made up my mind. I was about 40 then, and played mother to Manoj Kumar. He was so large and I was so tiny!" After that, Kamini played Manoj Kumar's mother in all his movies. She soon turned to direction (Meri Pari) and puppet shows. Her first puppet show, Khel Khilone on Doordarshan, got her a paltry Rs 300, despite her star status. But Kamini continued to do it, as she felt it was her responsibility towards children. "I have worked for 60 years now," she sighs. But this lady isn't retiring from the film scene anytime soon.